Zooids of Arachnidium pilosum. Photograph by Hans De Blauwe. I've written posts before on the Bryozoa, the aquatic (mostly marine) colonial animals sometimes known as 'lace animals'. On both previous occasions, the bryozoans in question have belonged the the group known as Cheilostomata. For this post, I'll be looking a members of another major bryozoan group, the Ctenostomata. While cheilostomes have their colony enclosed in a calcified body wall, ctenostomes have a soft chitinous or gelatinous body wall. Most ctenostomes do not form the tightly arranged colonies of cheilostomes, and the orifice of each individual zooid is not closed by an operculum as in cheilostomes (but read on). It is the delicate tracings of cheilostome colonies that lead to the name of 'lace animals'; if ctenostomes are to be compared with lace, it is with a mucky forgotten rag that has been allowed to rot in the mud. The Arachnidiidae are a family of ctenostomes that form trailing colonies across their substrate; the type genus Arachnidia was originally named for its resemblance to a spider's web (Harmer 1915). An individual arachnidiid zooid is roughly teardrop-shaped with the orifice at the bulbous end. 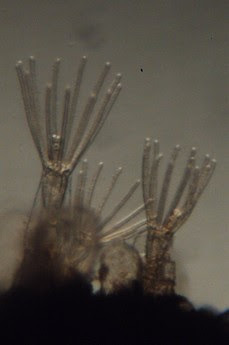 The branching pattern of the colony is roughly cross-shaped with the thin stolons of three daughters attached to the bulbous end of their parent. Both marine and freshwater species of arachnidiid have been described. It is primarily their colony structure that distinguishes them from other ctenostome families. Fossil arachnidiid colony, Arachnidium smithii, preserved on a bivalve shell. From Taylor (1990). Lacking a calcified skeleton, it is not surprising that the fossil record of ctenostomes is somewhat sparse. Ctenostomes are generally preserved as imprints on other fossils, either as borings or by a process called bioimmuration where another hard-bodied organism (such as a coral or another bryozoan) grows over the top of a ctenostome colony. 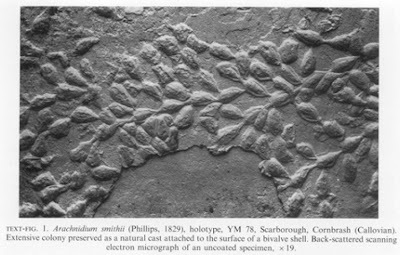 Ctenostome borings date back to the Ordovician, and arachnidiids preserved by bioimmuration are known from the Jurassic (Taylor 1990). However, although cheilostomes and ctenostomes are generally accepted as more closely related to each other than to other bryozoans, the cheilostome fossil record only dates to the Jurassic. It has therefore been suggested that cheilostomes were derived from ctenostome-type ancestors, making ctenostomes potentially paraphyletic (interestingly, this would imply that calcification arose independently in cheilostomes from Stenolaemata, the other major calcified bryozoan group). Among the Jurassic arachnidiids described by Taylor (1990) was one genus, Carboarachnidium, with a D-shaped orifice that Taylor interpreted as indicative of the presence in life of an operculum. As an operculum is a distinctively cheilostome characteristic, Taylor suggested that Carboarachnidium could represent a stem cheilostome. This could make arachnidiids the closest known relatives of cheilostomes among the 'ctenostomes' (though it has to be admitted that, as supporting links go, it's not the most robust), and potentially crucial in understanding the origins of that significant bryozoan clade. Taylor, P. D. 1990. Bioimmured ctenostomes from the Jurassic and the origin of the cheilostome Bryozoa. Palaeontology 33 (1): 19-34.